, 5400 rpm, 250 GBytes, 5400 U./Min. ¿Duración de Batería X-tra? Los tres modelos de la gama X de Samsung, llegaron a nuestra oficina editorial en los últimos días. Con el fin de atraer la atención del cliente, suponían anotar puntos especialmente en diseño y portabilidad. Revisamos esto en el modelo más pequeño, llamado X120, con un monitor de 11,6 pulgadas. El Samsung X120 es un equipo correcto que ofrece un rendimiento, comodidad al escribir y una calidad de construcción superior a la de cualquier netbook, al tiempo que sigue siendo muy portátil si tenemos en cuenta sus dimensiones y peso. Se enmarca en el nuevo segmento de ultraportátiles económicos, con un precio recomendado de 499 euros. Lamentablemente no está a la altura en uno de los aspectos más importantes a la hora de valorar este tipo de dispositivos: la autonomía. De poco sirve tener un equipo orientado a la movilidad si a duras penas sobrepasamos las tres horas de uso normal. Si nuestras necesidades nos permiten priorizar otros factores puede ser un producto francamente interesante. Pues seguramente el futuro se reparta entre los netbooks y los smartbooks. Han pasado más de dos años desde que empezamos a oír hablar de los netbooks, un concepto creado por Asus, que buscaba ofrecer portátiles de ultra bajo coste con unas prestaciones limitadas, pero suficientes para realizar la mayoría de las tareas más comunes. Empezaron costando en torno a los 300 euros, una cifra rompedora en comparación con los ultraportátiles que habíamos visto hasta la fecha, y que provocó un éxito de ventas sin precedentes. While the Samsung X120 is very neat and small laptop, it manages to pack a lot of performance in too. Don’t be fooled by the slightly anachronistic Pentium brand of CPU, as the 1.3GHz SU4100 has two reasonably fast cores to churn through tasks pretty quickly, and the 3GB of memory comes in handy too. We’d prefer the black lid to our silvery grey one, but we still had a certain amount of pride when drawing the X120 from our satchel bag, as its sleek looks and respectable keyboard (even if a few keys are oddly positioned) set this laptop apart from more blocky, basic designs. It's hard to remember back to a time when there wasn't some form of mobile computer, now that the market is flooded with laptops, notebooks, netbooks, tablets, PDAs and smartphones. The Samsung X120 notebook ideally bridges the gap between netbook and larger notebooks with its chic looks, light weight, powerful CPU and attractive keyboard, although it would benefit from a larger touchpad and longer battery life. 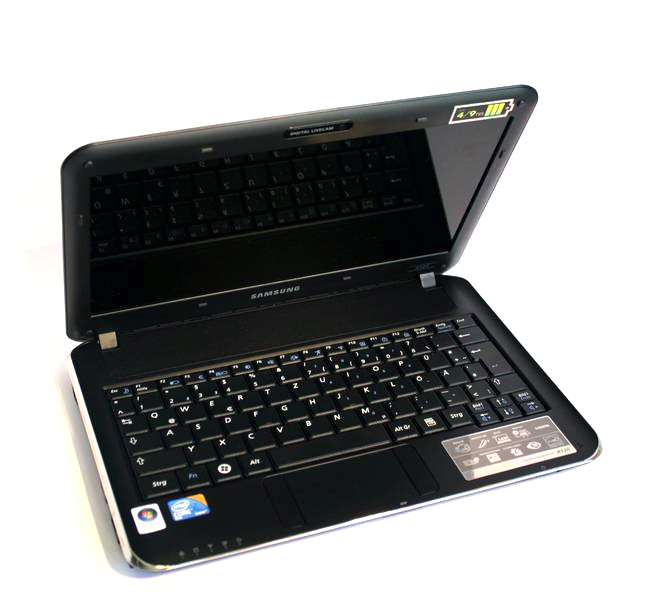 The Samsung X120 is a compact and lightweight laptop with 11.6in screen and Intel dual-core low-voltage processor. The Samsung X120 straddles the gap between netbook and notebook in size, albeit with a price erring towards the full-size category. Fortunately its overall performance is also very much in the realm of a fully featured laptop, and should recommend itself to anyone looking for a relatively quick but thin and lightweight laptop. We like the Samsung X120. With netbooks all offering the same specifications, and prices rising rather than falling, this product is a refreshing change. There’s enough performance to use for regular home and office tasks, and although it’s still not the fastest machine it features a great specification for the price. It also provides excellent quality, the screen is top-drawer, and it offers a high-end ultra-portable experience that’s out of sorts with the budget price tag. If you’re on the lookout for a compact machine, then the Samsung X120 is highly recommended. Competitively priced, stylish and portable, there's a lot to like with this Samsung ultraportable laptop. The Samsung X120is a small, stylish and very usable ultraportable laptop that is worth a look if you're after a well-priced machine to keep you productive on the move. If you're after a well-priced ultraportable there are now more options than ever on the market, but thanks to its great design and good portability, we'd be very tempted by the Samsung X120. Samsung made a big splash in the netbook market when it released the still excellent NC10. It came to the market late and learnt from the mistakes of others, producing a product that (at the time) fulfilled all the needs and desires of consumers. Samsung's first CULV laptop scores well in the design and performance stakes, but is let down by poor battery life for a segment that's supposed to promote it. Depending on your point of view it might not be a disaster, but it remains an opportunity spurned. The ultra-portable laptops with ultra-low-voltage processors that we've seen so far have all been thin and light, but none could really be described as 'affordable'. The Samsung X120 is by far the best ULV ultra-portable we've seen so far. It's cheap, highly portable and Samsung has made surprisingly few compromises. The only real disappointment is its lacklustre battery life, but, if around 2.5 hours of mains-free use is all you require, you'll be served well by the rest of the specification. If you are in the market for a netbook, but want something that is a little bit nippier than your average sub-£400 ‘mini-puter’ that are all the rage right now, then Samsung’s new ultra-thin and light X120 could well be just the ticket. The fact that it packs in a very handy HDMI output port, for when you’ve pitched up back in your lounge and want to carry-on with that iPlayer catch-up session, was the final cherry on the netbook-shaped cake that is the Samsung X120. The days of the dinky netbooks are numbered. Or at least that’s what Samsung wants you to think, with 11.6-inch screens cropping up on a raft of its newest machines. The Samsung X120 falls slap bang into this category. So is this just a little lappie with bigger screen real estate? Or a bulked up powerhouse? Read our Samsung X120 review now and find out. An excellent, powerful alternative to your common or garden netbook. 78.31%: Esta evaluación no es convincente. Debe ser considerado que difícilmente existen portátiles que reciben una evaluación abajo de 60%. Esta portátil es evaluada abajo del promedio, esta realmente no es una recomendación para la compra.